Million Cents slot is an iSoftBet creation that consists of 5 reels and 20 fixed paylines. This slot game is designed on a dark background filled with purple and pink hues. The slot game consists of the classic slot symbols like: WILD, Fortune, Blazing 7, Red 7, Brown Bar, Purple Bar, Red Bar, Double 7, Cherries and Triple Bars. Upon launching the game, select your coin value, number of coins and spin away! In case you’d like play with the maximum value per line, use the Bet Max Button to make the max bet on max lines. All wins pay from left to right of the slot grid. 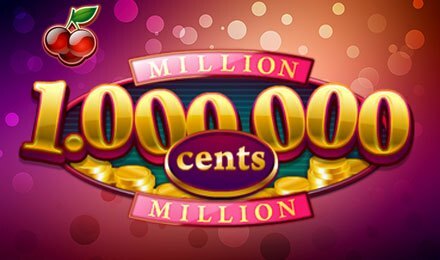 Million Cents slots can be played with the Autoplay option. With this option, you get to select from 5, 10, 15, 20, 25, 50, 75, 100, 200, 300, 400, 500, 750 and 1,000 auto spins to put to play. Bet Levels: Bet levels available range from 1 to 5. Amount of Paylines Selection: All paylines remain fixed and cannot be changed. Coin Values: Default coin values range from £0.01, £0.02, £0.05 and £0.10.